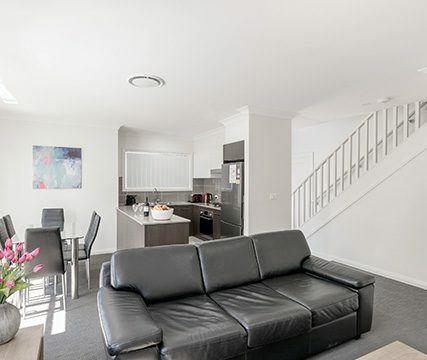 Located near the Wallsend Shopping precinct, Wallsend on Longworth apartments feature custom made leather lounge furniture, smart TV’s in lounge rooms and main bedrooms and fully equipped kitchens. Additionally there are two bathrooms in each apartment both with complimentary bath accessories and a third toilet downstairs. Complimentary high speed WiFi is included. Secure parking in single garages operated by electric garage door openers. 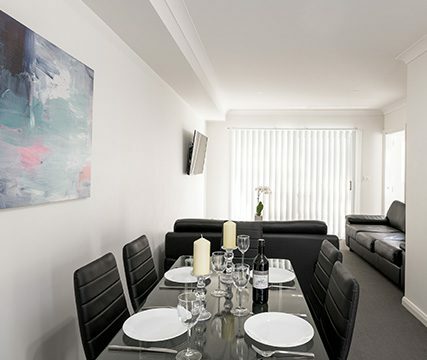 Kitchens include dishwasher, oven, four burner hot plate, Nespresso coffee machine, microwave and electric jug. Each unit has a courtyard with outdoor furniture suitable for 6 guests. Newcastle is 11.3 km from the apartments, while Nelson Bay is 57.9 km from the property. The nearest airport is Williamtown Airport, 30.6 km from the property. Spotless, spacious unit in a good location. The lockup garage was a bonus and having two bathrooms very handy for four people. Extremely clean and new. No smells, and a working air conditioner. quiet neighbours, and space for a car in garage plus a visitor spot in the driveway. Netflix in the living room and master bedroom. Loved the layout of property and cleanliness. Easy access to check in and check out.